"Music, books and the beauty of nature all play a role in molding the character of the women this book shadows. In her exceptional first novel, In Hovering Flight, Hinnefeld wrote about nature and made bird-watchers her principal characters. (Clearly, she is not without courage.) Now, in Stranger Here Below she also celebrates the healing power of the natural world. And here again, she makes the texture of the book surprising in all that it is able to contain, without clutter." "'Stranger Here Below'" is a novel about civil rights in the '60s, the onset of the Vietnam War and the legacy of various American religions -- religions that may have died out but still influence how we live." Hinnefeld's second novel (after In Hovering Flight) begins with a letter from Maze Whitman to her former Berea College roommate Mary Elizabeth (M.E.) Cox. Maze regrets that they have lost touch, particularly because of the circle of women important to them both. At the center of their lives is Georgia Fenley Ward, a tall, large-boned, defiant Quaker woman. When Sister Georgia was 16, she fell in love with a black man, and her father sent her to Kentucky to teach at Berea College. Still there 60 years later, she meets Maze, a spirited, unconventional girl who finds nothing unusual about rooming with M.E., a musically talented black girl. Maze then meets Harris Whitman, a furniture maker and activist, and by 1963, Maze and Harris join M.E., Sister Georgia, and four others as squatters at an old Shaker inn. They are soon evicted, and they are all sent back into a world in turmoil. VERDICT: This is a multigenerational novel spanning decades rich in history, but ordinary women, who suffer from life's challenges and keep secrets, are at the heart of the story. Recommended for its wide appeal to readers seeking thoughtful, well-written fiction. "Stranger Here Below is beautifully written and organized. The third-person narrator's voice stems from an oral tradition of storytelling, which engages the reader and aptly reflects the characters and environment of the novel." "You will fall in love with all of these women, through their hurts, betrayals, disappointments, and quiet triumphs. Most of all, this is a tale about the ties that bind us all to one another." "This book delved into many sad and serious topics; however, I didn't find that I was depressed when I finished reading it. In fact, I was left with a reminder of the strength of women throughout the generations and the beauty of female relationships. STRANGER HERE BELOW is a book to be treasured for many reasons, and I definitely recommend it." "Hinnefeld presents her novel in chapters that fluctuate among the varied characters and from a time period that spanned from the 1870's through 1968. In my opinion, this technique kept the reader on edge from the onset. Absorbing throughout, this attracted the reader with multiple perspectives and the multi-layered depth given by hearing from all three women. This is a deeply reflective and noteworthy historical fiction novel I highly recommend." "By the time I read the last page, I was fully absorbed in Stranger Here Below. Its characters were real and complete, and even though the novel only covers a few years of the main characters' lives, the other women's stories made it feel like a lot had happened. I enjoyed knowing not only Maze and Mary Elizabeth, but Vista and Sarah and Sister Georgia and the others as well." "It's a grand scheme, and this book covers a lot of territory in few pages. Hinnefeld begins in 1968, with Maze writing a letter to her missing friend Mary Elizabeth. The next chapter takes us back to 1872 and the birth of Sister Georgia. The lives of all five women unfold in a nonlinear fashion, in isolated sections, and these sections weave in and out of the book's present and deep into the past. Perhaps this weaving back and forth in time reflects the fractured nature of these women's lives. Sometimes it's hard to put the pieces together, just as it's hard for the women to keep their own lives in order. As readers we have to work for it, but in the end I think it's worth the effort. I cared about these women and the pressures they stood up to in their struggles to make themselves whole." "Hinnefeld's writing is as gorgeous as it ever was and I found this novel to be very accessible without losing its subtlety, complexity or beauty. Stranger Here Below has easily earned a place among the handful of books I have read this year that I immediately wanted to start reading again." "Hinnefeld’s gift is an ability to bring the past into the present, marrying the two in the acute and personal suffering of each individual, revealing a web of family ties and long-hidden secrets. Linked through their stories, these characters influence one another in dramatic ways, forging relationships that expand their experiences and teach them compassion for those we do not understand." "Stranger Here Below is a sad novel, but one that is also filled with hope and renewal. It is a reflective and thoughtful book which demands quiet attention. Readers who are looking for an exquistiely written, literary novel with an exceptional cast of characters will not want to miss this one." 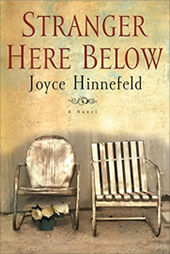 "Stranger Here Below by Joyce Hinnefeld is a book that will have the reader pondering the greater implications of family long after the last word is read. Hinnefeld creates a stunningly beautiful, sad and yet hopeful, story of the lives of three generations of women spanning the years 1862-1968, all interconnected in a non-linear manner throughout the novel." "The story is about family, how much we owe them, and the bonds that string us together. The story is about friendship and how much we owe friends, how much we grow together. The story is about race, the importance of race in the early and mid 1900s, or the lack of importance given to it by some. The story is about potential and about limitations – both our own, our friends, those foisted on us due to our gender, race, and class." "This is an amazing story of how ties that bind families together can't be broken, but also how sometimes our family is more than just people we are related to." I read In Hovering Flight earlier this year and enjoyed it. But Hinnefeld's latest book…oh, this one is made of awesome. It's completely different than In Hovering Flight, both in subject matter and setting. Although both books focus on women and identity. In her lovely new novel, Joyce Hinnefeld introduces us to a fascinating cast of characters—sisters, visitors, pilgrims, strangers—and untangles the mysteries of their lives with her distinctive grace and delicacy. She is a remarkable writer who gives her readers pleasures to savor on every page. author of Follow Me, The Manikin, Arrogance, etc. Stranger Here Below has the feel of an heirloom, treasured stories of friendship, misunderstanding, forgiveness, and mystery. All woven beautifully together by Joyce Hinnefeld's deft, homespun prose. It's a novel I hope mothers and daughters will read together. Like many people of my generation, I had always thought that what we call "the sixties" was the start of something, but much of this fine novel reminds me that the sixties were the end of an era, too. The central characters—Maze and Mary Elizabeth—are coming bravely into the unknown. Enthralled by their journey, I did not want the book to end. author of In the River Sweet, Hummingbird House, etc. The words lyrical, mystical, impressionistic, nuanced, come to mind when I think of how I felt reading Stranger Here Below. I didn't know anything about the Shakers, nor the history of Berea College, so it was informative and enlightening in that regard.